Does this voice of doubt sound familiar? If you find yourself excited about learning new things, but limited by a full-time work schedule and other life commitments, you’re not alone. 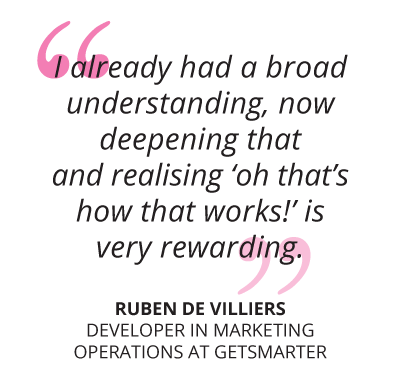 Meet Ruben de Villiers, a Marketing Developer at GetSmarter’s Observatory campus, and a student on the University of Cape Town User Experience Design online short course. “I help develop and maintain websites and landing pages to meet the strategic needs of our marketing department,” says Ruben of his full-time role. 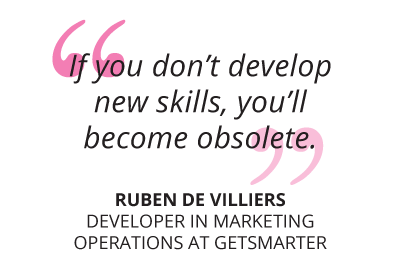 It’s a varied and demanding job, and his work in the dynamic GetSmarter team requires him to be adaptable and ready to respond to new challenges and strategies. What made Ruben decide to add an online learning experience to his already jam-packed, work-life balance? Ruben credits time management as a key factor in getting the most out of his online short course. “I try to get in two hours of study time a day, depending on what’s happening in my workday. It can be difficult to manage, but you always have support from your Student Success manager to help you manage your time better.” Ruben spent time reading about time management strategies before starting his course, and he says thinking of time management like budget management has helped him succeed in his studies. Ruben suggests using Google Calendar to plan your week in advance since time is a resource. He also advocates keeping focused on the end goal – the benefits of the certification – even if that means studying instead of socialising with friends until your course is complete. 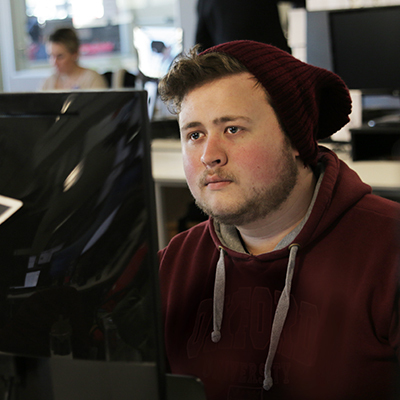 He also finds the Online Campus more organised than his university studies, making it easier for him to fit his studies into his schedule when he has a free hour, or over his lunch break. With new modules released weekly, and a systematic assignment schedule, it’s easy to plan ahead around the weekly demands of the course. 2 min User Experience (UX) Design allows users to interact with products or service offerings in a meaningful way through innovative design. 3 min The effective use of web design ensures this small, but necessary, organ keeps a business in the consumer's mind. 4 min User experience (UX) design has evolved into a necessary discipline over the past few years, the only difference today is the focus has moved from manual to digital.